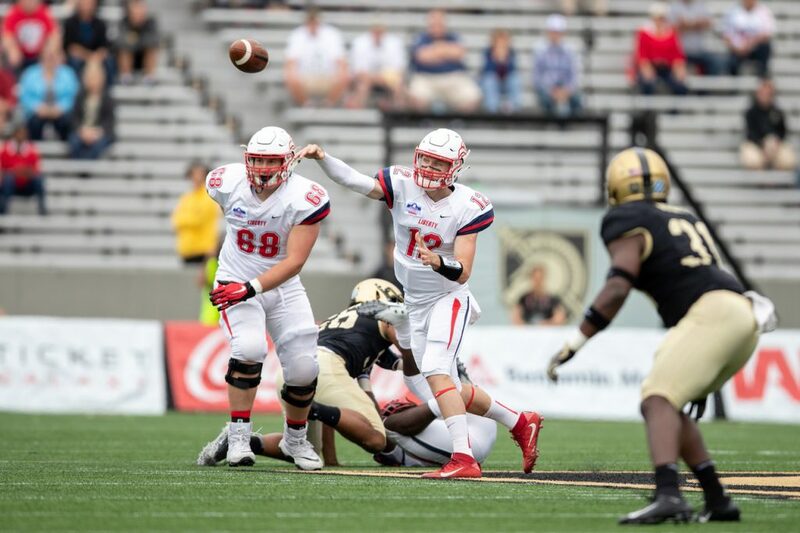 In a game where Liberty saw triple option offense for the first time since the loss to Kennesaw State last season, the Flames could not find a way to stop Army’s rushing attack in a 38-14 loss Saturday afternoon at Army. The Flames put up 14 straight points in the third quarter after trailing 24-0, but after junior quarterback Buckshot Calvert overthrew a wide-open Damien King on a home run ball, recovery was out of reach. Two plays later, following a punt, Army executed on a 10-play drive, seizing momentum from Liberty and flipping the switch from a possible three-point game to a 17-point game. Calvert then threw an interception on the first play of the very next drive and Army took full advantage. Army led in more categories, including rushing yards, total yards, turnovers, time of possession and most importantly the score department. Liberty caught breaks on four or five chop blocks, including two that brought back touchdowns, but it did not prove to be enough as Army eventually dominated the scoreboard. Liberty (1-1) will return home Saturday, Sept. 15 at 6 p.m.
for Hall of Fame weekend against Norfolk State (1-1).